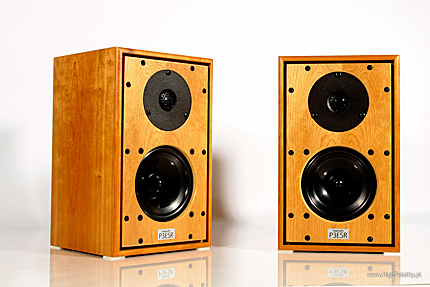 The original loudspeaker HL-P3 were designed by Alan W. Shaw to replace the loudspeaker LS3/5A built on BBC license. The history of that one is rich and surprising – we can learn it reading the test of the anniversary version of those loudspeakers HERE. And you should read the text of John Atkinson, which is one of the more complete compendia of knowledge about those loudspeakers (HERE). Additional information can be found in one of the basic books for audio - Sound Bites. 50 Years of Hi-Fi News by Ken Kessler and Steve Harris, the chapter The BBC influence (IPC Media, London 2005, s.116.). So here and now we have to say, that the P3ESR is a two-way bookshelf speaker, which predecessor was designed for the BBC studios as a near field loudspeaker. This is a two-way design in a tiny, closed cabinet made from MDF. 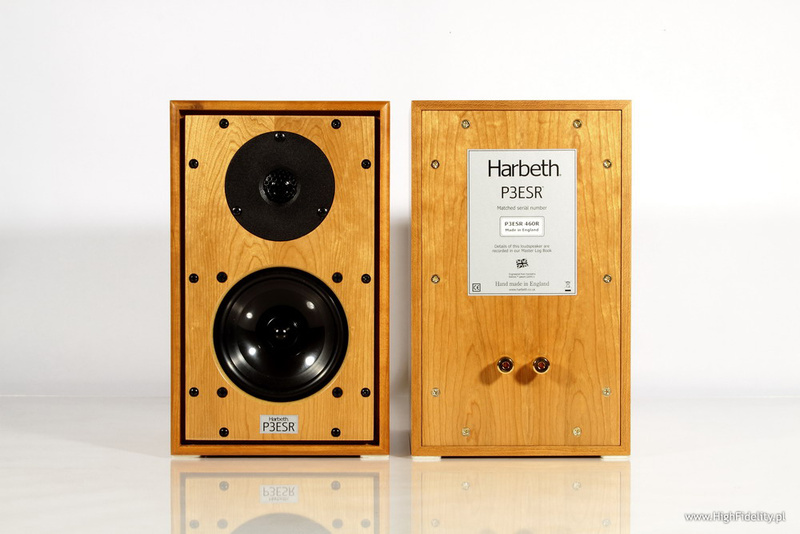 The tweeter was bought from the Norwegian company SEAS, with modifications ordered by Alan Shaw, the owner and boss of Harbeth, while the midwoofer was manufactured by the company itself. Its diaphragm is made from a material called Radial, now in the newest version with a “2” in the name. The wire terminals are singular. 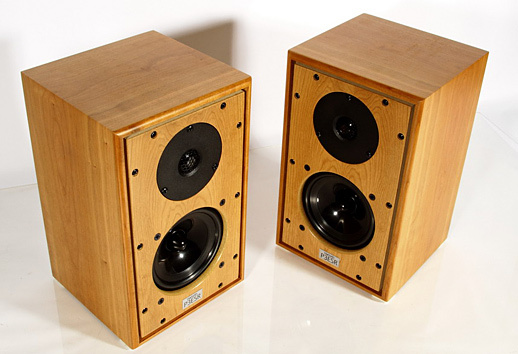 The loudspeakers are made in Harbeth’s own factory in England. The basic version in natural veneer costs 5900 zl, while other finishes are available for 6300 zl. Anja Garbarek, Briefly Shaking, EMI, 8608022, Copy Control Disc; review HERE. Carmen McRea, Carmen McRea, Bethlehem/JVC, VICJ-61458, K2HD. Depeche Mode, Sounds Of The Universe, Mute, STUMM300, 2 x 180 g LP; review HERE. Diorama, Cubed Deluxe Edition, Acsession Records, A 114, 2 x CD; review HERE. Frank Sinatra, Nice’N’Easy, Capitol/Mobile Fidelity, UDCD 790, gold-CD; review HERE. Jean Michel Jarre, Oxygene, Dreyfus Disques/Mobile Fidelity, UDCD 613, gold-CD. King Crimson, In The Court Of The Crimson King, Universal Music K.K. (Japan), UICE-9051, HDCD. Kings of Leon, Only By The Night, RCA/BMJ Japan, BVCP-40058, CD. Laurie Anderson, Homeland, Nonesuch, 524055-2, CD+DVD; review HERE. Marylin Moore, Moody Marylin Moore, Bethlehem/JVC, VICJ-61467, K2HD. Peter Gabriel, So, Virgin, SAPGCD5, SACD/CD. Savage, Tonight, Extravaganza Publishing Srl/Klub80, CD001, 25th Anniversary Limited Edition, CD; review HERE. Japanese versions of the discs can be found on CD Japan. The listening session of the Harbeth started untypical, because not with the reference system. Usually I start to make my opinion about a product connecting it to my system, replacing the corresponding component. This gives a clear picture, because I replace only one element in the system and I immediately know what that change brought. But this time on the Pro Audio Bono platform, which I just bought, I had the QUAD II Classic Integrated amplifier, tested for the same issue of “High Fidelity”. 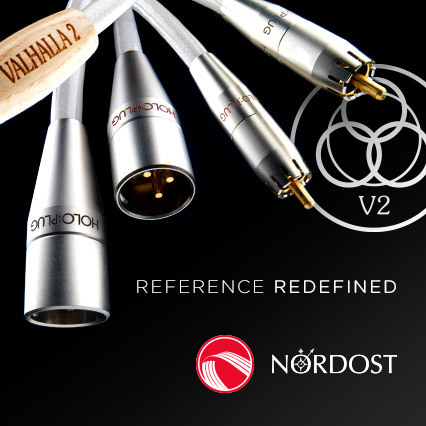 One glance of an eye was enough to have the loudspeaker cables run to it – not so big, nice design, noble birth – those are the common characteristics from both brands. Combining those two British (well – one half British) brands gave such fascinating results, that I stayed with it longer than needed by the procedure. If not for the need to conduct a classic test, to learn how the Harbeth sound, and not the Harbeth + QUAD combo, I would have stayed with it forever. If you read the test of the Classic Integrated amplifier, you know, that it is characterized with a warm, even “scorched” sound. Its treble is rather withdrawn, while the bass is muscular and strong. The midrange is in the center of attention, but it does not reign unanimously, because the mid bass together with the midrange gives a strong basis for all instruments and makes the sound stage big and expansive. With the Harbeth all those elements were clear, I could make the test using only them. I would not be able to tell much about the lower bass, because we don’t get any from the 3PESR, but I would have quite a clear picture of the amplifier. Yes, I know, the amplifier is not the object of the test. But you have to know, that it was the QUAD, which imposed the general character on the set, and it is the “significant” element here. The British loudspeakers approached it synergistically, communicating well with the electronics and the listener. Discs from the 50-ties sounded just phenomenally, I was pressed into the sofa (I plan on exchanging it, so additional damage did not impress me). Not only those, about that in a minute, but they shone like stars. I am aware, that there are not many lovers of that kind of music, from labels like Savoy, Bethlehem, Prestige, Mode Records, Tampa Records etc. Not so many. A pity…But there is something I have to start with, and the impressions I had based on Carmen McRae Carmen McRae or Moody Marilyn Moore Marilyn Moore transposed to other genres, also absolutely modern one. This set sounded in a very nice way. The description “friendly” would go a bit too far in the direction of unification and too far from neutrality. QUAD with Harbeth was, in its beautiful timbre, closer to neutrality. This was a warmed sound, but not mudded. I had no impression of any lack of dynamics, nor “closing” of the sound in some boundaries. The treble was not especially resolving, but at the same time not so withdrawn. In fact it was only an addition – an essential one, a creative one, but only an addition – to the midrange and bass. Yes – bass. The British loudspeakers are miniatures in all aspects of the word. There is no lower bass in them. But the art of making loudspeakers means, that you try to act against the restrictions, try to overcome them – this is an ongoing fight to give sense to the sound. In the end it is still the most imperfect element of the sound path. The Harbeth communicate perfectly with the listener. But they need help – that does QUAD. Its strong bass allowed to reproduce most of the discs with unexpected might and bass (without its lower part of course). The flaws of small speakers are obvious, but in this case they were alleviated for a moment, loosened for a while, so it seemed, that the loudspeakers are bigger than in reality. The voices had an incredible intensity. I mentioned the two vocalists recording for Bethlehem records, but the same happened with Frank Sinatra and Savage, to show you the spectrum. With the last disc I was surprised with the extraordinary dynamics, extraordinary in general, but given the dimensions – astonishing. Those are disco recordings, requiring rhythm and “progressive” dynamics, about which I wrote in the test of the loudspeakers Terra II Pro EBTB (in this issue of HF), so it is dance music by definition. And the rhythm, drive and swing, or whatever we will call it, is at best, limited in small loudspeakers. Here I did not hear anything like that, quite otherwise – everything sounded like coming from big, well balanced loudspeakers. Without lower bass, without explosive dynamics, that is obvious, but I did not miss it really, let alone cry about it. To start the description as objectively as possible, I should start as follows: those are incredibly accurate loudspeakers. Their lower bass is nonexistent, but subjectively, with appropriate amplification, its lack will not be perceptible. The impulse characteristics of closed cabinets are known, but here those are not only repeated, but the shortcomings those have, are not audible. Bass is not dry and anemic. There is as much of it, as was recorded on the disc, and even if we do not “feel” the low passages, the higher harmonics will inform us about them, integrated in the sound. Their selectivity is perfect, and even very low passages, on which the piece Sleep from Anja Garbarek from the disc Briefly Shaking is built around, did not destroy the emission.